What we told is carefully controlled: we are not told things that somehow do not fit in with conventional wisdom, especially if something that is supposed to be very bad for us turns out not to be. An example surrounds cigarette smoking. Although it is unpleasant for those of us who do not smoke, the dangers are not straightforward. There are several examples of this and a recent one follows. A publication in the renowned medical journal The Lancet in April 2014 compared the outcome from heart attacks (myocardial infarction, or MI) in Sweden and in the UK. I will use the abbreviation “MI” in this Post - it is the usual term used by doctors. The time period of the study was between 2004 and 2010. The people studied came from national registers, 120 000 in Sweden and 390 000 in the UK. The average age in each country was about 70 years. The main finding of the study was that outcome was better in Sweden, in which the death rate at 30 days following MI was 7.6%, compared to 10.5% in the UK. This is not surprising: no matter which disease is studied, the frequency seems to be highest and the outcome worse in the UK than in other European countries, especially in the north-west of the UK. I suspect that this is biological / geographical, and that the relatively low level of sun exposure of the population of the UK is the key factor. The population of Sweden has overall better health than that of the UK, especially the north-western parts, and it has a sunnier climate. However an alternative view assumes that there is a relatively poor performance of the health services in the UK. This is usually assumed to be the case and the result is a very much top-heavy response by the government to over-manage the NHS as judged by many of the staff. One factor brought out in the study was the low level of immediate coronary angiography and stent insertion in the UK. The term used is PCI, meaning percutaneous coronary intervention (as opposed to open surgery CABG, coronary artery bypass grafting). This was certainly true in 2004, but in the subsequent 5 years the UK caught up with Sweden, but the effect of this approach in determining outcome is not entirely clear. We can see in Figure 2 that the death rate has declined between 2004 and 2010 in both Sweden and the UK. Although it is nice to put this down to improved medical treatment, I have demonstrated in a previous post that there has been a steady and exponential decline in population death rate from MI in the UK since 1970. We are now in the end-stage of an epidemic. Please note that this is not the number of deaths each year or even the number of MIs each. It is the percentage of those who have an MI who die each year. 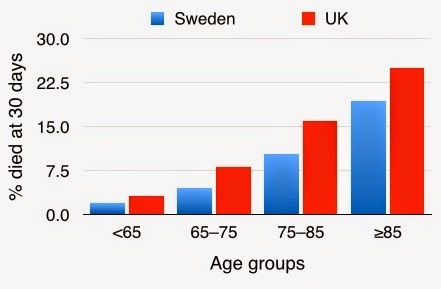 Figure 3 shows the higher death rates in the UK in all age groups. 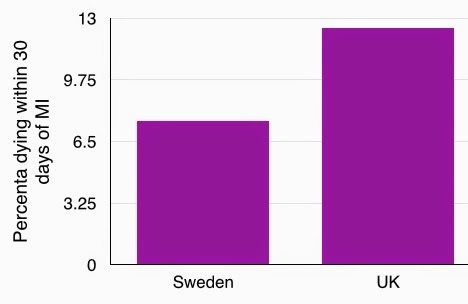 In both Sweden and the UK the death rate, the proportion who had died at 30 days after MI, became much higher with increasing age. In those less than 65, only 2% and 3.2% died, whereas in those aged greater than 85, 19.4% and 25.2% died. Is the high death rate in those aged 85 or more really a cause for concern? Most of us who survive to the age of 85 will maintain quite good health, but after 85 the quality of living deteriorates and independence becomes a thing of the past. There are of course exceptions, but there is increasingly concern about the “burden of old age”. Death from old age can be prolonged and unpleasant. Death from myocardial infarction can be regarded as a “quick way out” that many of us might welcome at this age. The study also demonstrates the worse outcome from MI in people with diabetes (a better description than calling people “diabetics”, a term that I dislike). 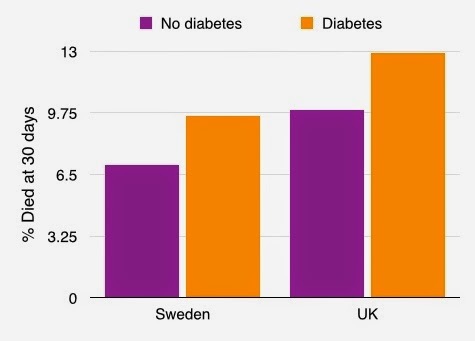 The difference in death rate was 9.9% in Sweden as opposed to 7% in those without diabetes. In the UK the death rate in those with diabetes was 12.9%, compared to 9.6% in those without diabetes. We see this in Figure 4. Now we come to the interesting data. In both Sweden and the UK, the death rate following MI was higher in people who did not smoke! 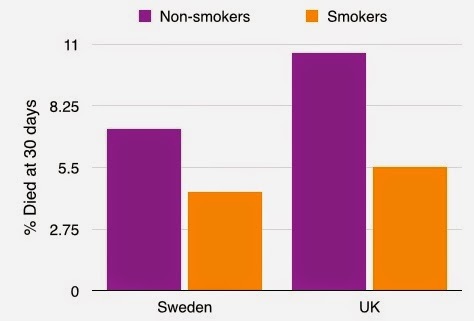 In Sweden the death rate was 4.4% in those who smoked and 7.2% in those who did not smoke. The corresponding numbers in the UK were 9.6% in those who smoked and 12.9% in non-smokers (Figure 5). In other words, not smoking gave a similar excess risk of dying after MI as having diabetes. This finding is what is known as "counterintuitive", meaning that it is against what would be expected. There is no ready explanation but it is a remarkable curiosity. In fact although the data is plain to see in the results table in the Lancet paper, there is no mention of it in the text or in the conclusion. Although this finding was not a primary intention of the study, it was a such a unexpected curiosity it should have been given at least a mention. In practical terms the finding is not of value. No-one would consider offering cigarettes to patients on a coronary care unit. As an observation it requires an explanation. It could be just a “statistical error”, but the large number of people in the study (more than 500 000) makes such error unlikely. Carelessness of the authors in simple arithmetic is also most unlikely and would have noted during the editorial process. The point is that things that do not fit in can either be investigated further or they can be suppressed, as is the case here. It shows the importance of reading carefully the methods and results sections of scientific papers, and not relying on conclusions, abstracts, and newspaper summaries. Further interesting observations on cigarette smoking will follow shortly. Acute myocardial infarction: a comparison of short-term survival in national outcome registries in Sweden and the UK. Chung S-C et al. Lancet 2014; 383: 1305. Maybe the smokers were younger. People tend to quit as they get older, and smokers might have a MI at a younger age, and thus survive better. Another possibility is hormesis of cigarette smoke, which causes a preconditioning effect on cardiac cells. The paper contained no breakdown of the details of those who smoked, as this was not the object of the study. We do not know whether or not they were younger. The point I try to make is that the apparent advantage of smoking, true or not, was completely ignored in the discussion. I cannot comment on possible hormones. The data I have not from this paper) is that all grades of smoking have shown disadvantage. Again, a possible advantage from smoking a small number of cigarettes is likely to have been suppressed. What we are told is controlled. Another thought provoking post David - welcome back after your absence! I don't think you have posted on hormesis. I would love to read your thoughts in a post. Sunshine hours (from http://www.metoffice.gov.uk/climate/uk/summaries/datasets) for North of England have steadily increased from an annual mean [1961-70] 1263 hours to [2001-10] 1446 hours . An extra 183 hours per year or 1830 hours over the decade. Which would suggest enhanced vitamin D levels in population over this period. The changes for N Scotland [1961-70] 1046 hours to [2001-10] 1137 hours. An extra 91 hours per year. should be no suprise to a reader of your enlightening book (Vitamin D and Cholesterol: The importance of the sun). May be possible to compare sunshine trends with those in Sweden and elswhere? The smoking restrictions in public buildings (from 2007?) mean most smokers now regularly nip outside “for some fresh air” ,so exposing themselves to regular short intervals of sun.Perhaps we should encourage everyone to have lots of fag breaks! The sun does protect against the detrimental effects of smoking - see Blog Post shortly. ...and smoking also protects against the detrimental effects of the sun! The Cutter incident and the development of a Swedish polio vaccine, 1952-1957. “Sweden is one of the few countries that came to produce its own inactivated polio vaccine (IPV) in the 1950s, a type of vaccine they never abandoned. “ [http://scielo.isciii.es/pdf/dyn/v32n2/03.pdf]. 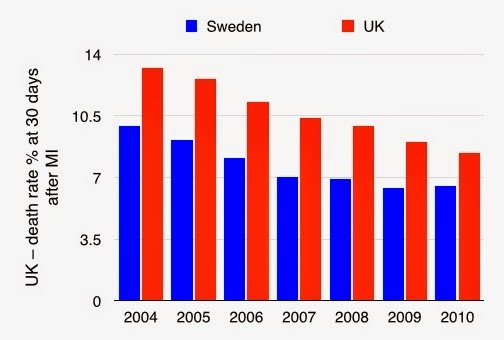 Sweden has avoided dramatic cancer epidemics of other developed countries,such as UK. And I was trying to find out if SV40 had any role in diabetes rates. My husband and I had contaminated vaccines in our childhood. There is NO family history of diabetes. Yet we have it. So I wondered...and came across this very interesting website - and then your comment about Sweden. I'm about four years behind the times in commenting here, but I think I have something worthwhile to add. Dr. Grimes, you highlighted the Lancet authors' failure to point out the counterintuitive results for smoking. They do NOT stand alone in that, although the example I'm about to give is bit different. Instead almost every CI crossed the 1.0 mark, thereby failing to show a significant association (although the general "leaning," non-significantly, was toward association), HOWEVER... one particular result DID show a significant finding! The odd thing is that although the numerical statistical result is shown in both the body of the study AND in the Conclusions/Abstract, this ONE significant finding for an entire group is described verbally as, "not associated with," and "no association between." Strange that they'd take the one real, actual, statistically significant finding in their study and describe it that way, eh? "ETS exposure during childhood was not associated with an increased risk of lung cancer (odds ratio [OR] for ever exposure = 0.78; 95% confidence interval [CI] = 0.64-0.96)." AND "Our results indicate no association between childhood exposure to ETS and lung cancer risk." When you see this sort of gymnastics being played in the presentation/depiction of the raw data, you can't help but wonder what part such bias played, either consciously or unconsciously, in unsuccessful skewing of the data itself. And if the existence of such a bias is so clearly evident in such a well-monitored and highly respected piece of research, how much MORE must such bias exist among researchers who depend upon "funder-pleasing results" at their one-school-based institutions where they're depending upon those funders to give them a grant the following year to pay off their mortgages. Note that of the 130 studies, only about 15 were able to pass even the bare minimum test of statistical significance between secondary smoke exposure and lung cancer! It is additionally a contributory factor for upper respiratory bothering and diseases and in addition diminished lung work.